Current Position: Currently serving as Chief of Party, CARE International in Ghana after 7 years in the same capacity in the Democratic Rep of Congo (DRC). 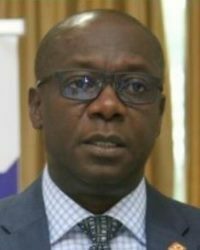 Michael also worked at the World Bank in Washington, DC during which he served as Parliamentary Consultant in leading a study that reviewed the performance of the Parliament of Ghana. Michael Alandu has over 15 years program management and technical experience in post conflict early recovery, stabilization and development: designing and managing cross-sectoral projects, civil society strengthening, decentralization, peace building, and land conflict management for improved agricultural production, alternative livelihoods and women’s economic empowerment programs. He has extensive experience in managing multi-stakeholder and multi-donor funded projects, including USAID, DFID, Dutch MOFA, foundations and private donors ranging from USD $6 – $22 million.